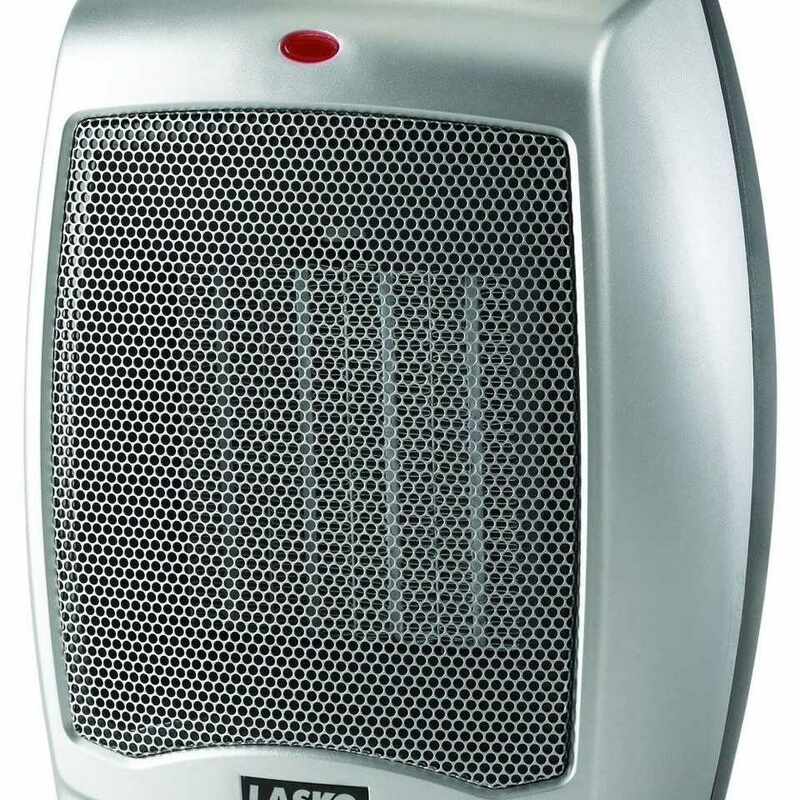 The best-selling Lasko 754200 Ceramic Heater is a longtime favorite of buyers who need a reliable, effective space heater without spending a ton. Owners and experts say it does a great job of churning out ample heat quickly in a small bedroom or office. It also features a fan-only mode, making it handy year-round, though some report that it’s too small to cool as well as it heats. Like most less-expensive space heaters, the Lasko 754200 doesn’t have a ton of extra features. It has three settings (low heat, high heat, and fan only) and an adjustable thermostat. Both are controlled by a dial. The unit shuts off automatically if it overheats, but there is no tip-over sensor. Reviewers love how compact and lightweight it is, saying it’s easy to tote around the house with a built-in carrying handle. While it’s not the quietest unit on the market, most owners say the white noise is easy to get used to, and some even like it. Vornado is well-known for its fans, and reviewers say that this expertise shows in the Vornado VH2 Whole Room Vortex Heater, a space heater with a fan mode that isn’t merely an afterthought. 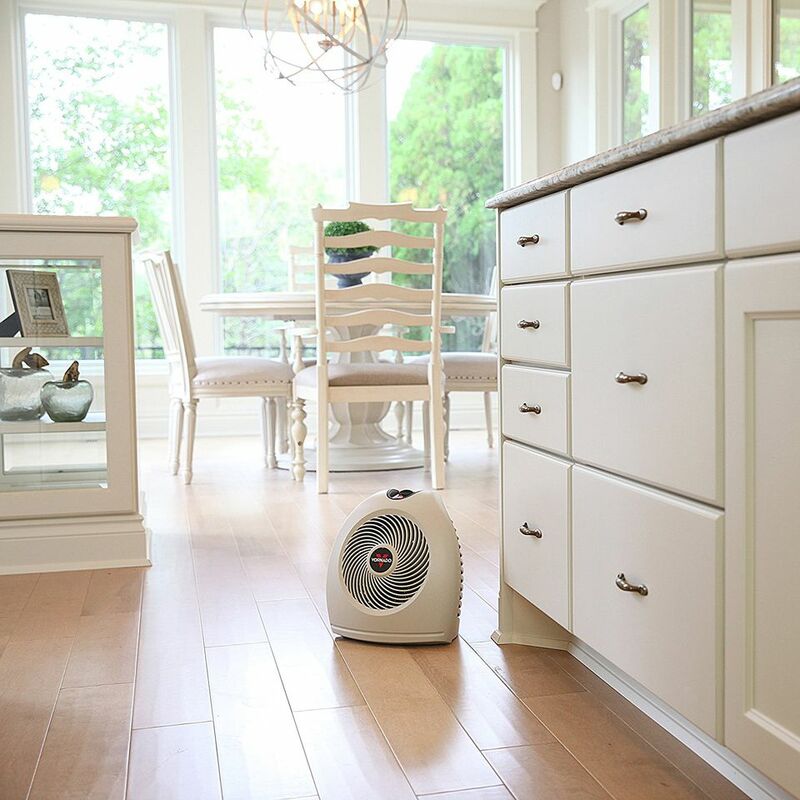 A good pick for up to a medium-size room, the VH2 is engineered to heat a room more evenly than most space heaters, but owners say it also does a fine job of circulating air in warmer months. The VH2 has an adjustable thermostat, two heat settings (low and high) and two fan settings (auto and high). It has simple button and dial controls, but it doesn’t oscillate, a must-have feature for many fans. Reviewers say it’s very quiet, though a few complain that the noise is more noticeable when the unit cycles on and off to maintain a certain temperature. Safety features include tip-over protection and an automatic safety shut-off if the VH2 overheats. The casing stays cool to the touch, an important consideration for anyone with pets or small kids. Check out our other reviews of the best fans to buy today. The heater is specially designed to promote air circulation through a room so you aren’t wasting energy while heating a space. The main tower oscillates back and forth to evenly distribute air. The heater itself quickly forces air through the heating elements to efficiently get the space toasty in no time. Want to take a look at some other options? See our guide to the best space heaters. A feature-packed fan and heater combo that was built with dual heating and cooling in mind, the Dyson AM09 Fan Heater is also easy on the eyes (but not on the wallet). Reviewers who’ve paid the premium price say they love the tall, sleek design, and most say it’s good at warming up a medium-size room. Experts agree, giving it top marks for both room heating and spot heating. However, a few complain that it’s a much more effective heater than fan. Available in black/nickel, iron/blue, and white/silver, the AM09 does boast more than good looks. It includes the ability to focus airflow in a long-range stream or a wider, more diffused area, an intelligent thermostat that can automatically maintain a certain temperature in heat mode, a sleep timer, oscillation, and a magnetized remote. There are 10 fan settings in both heating and cooling mode, a tip-over sensor and stay-cool housing. Reviewers rave about how quiet the AM09 is, saying it’s an especially good choice for bedrooms. Buyers who want a personal space heater and fan with some flair at a reasonable price will want to check out the Vornado SRTH Small Room Tower Heater, which has a sleek, modern design that will fit in with most decors. Available in black and white, the unit is best for small offices or bedrooms and has a fan-only mode for warmer months. The Vornado SRTH has three settings (low, high, and fan-only) and a simple dial control. There is also a four-hour timer. It will automatically shut off if it overheats or tips. Reviewers say it does a great job of heating up small spaces, but few comment on fan mode. Experts give it very good marks when it comes to noise, and they also say that this heater stays cool to the touch while it’s on. At about 12 by 6 by 6 inches, it’s also small enough to sit on a desk, counter or tabletop, keeping the floor uncluttered. Most fan heaters do a better job of heating than cooling. Buyers who live in warmer climates and are more serious about the latter should take a look at the Frigidaire FFRH0822R1 Air Conditioner/Heat Pump, an effective window air conditioner with the added bonus of a heat pump for chillier days. This 8,000 BTU unit is recommended for rooms up to 350 square feet. The Frigidaire FFRH0822R1 has three cooling speeds, three fan speeds and one heat setting. It also features a 24-hour timer, sleep mode, energy-saver mode, remote control, and washable antibacterial mesh filter. Owners say it’s simple to install and does a great job of keeping the room cool. They also say the heat mode is very effective, but it’s best for days that are chilly, not extremely cold. That’s because once the outside temperature gets close to freezing, performance falls off as the heat pump can’t draw much warmth from the air. Most reviewers find it fairly quiet for a window air conditioner. Fan and heater combos meant for bedroom use should be effective, easy to use, and quiet. Reviewers say the Vornado iControl Whole Room Vortex Heater is all of those things, and highly recommended for evenly heating any small or medium-size space. They also like the fan-only mode, which they say circulates a good amount of air in a stuffy room. Experts give it good marks for whole-room heating, though they caution it’s not quite as good at spot heating as some other models. The Vornado iControl has an LCD display and a simple-to-use knob that that controls the two heat settings, thermostat, and fan-only mode. It also has a remote control and sleep timer, two features owners especially appreciate in the bedroom. Most reviewers also say it’s fairly quiet no matter the settings, with a fan that runs continuously for slight white noise instead of constantly turning on and shutting off. The housing stays cool to the touch, and experts note that the unit is safe around curtains and other flammable materials—a big safety consideration for bedroom use. We bought one of our readers’ favorite combination fan and heaters and our reviewers tested it daily for three weeks. We asked our testers to consider the most important features when using this fan and heater unit, from temperature control to noise level. We’ve outlined the key takeaways here so that you, too, know what to look for when shopping. Temperature control Any combination fan heater will let you choose between having the heater turned on or just operating the device in fan-only mode. But some combination fan heaters also give you thermostat control to set a target temperature for your space. This is something to consider if you plan to use the heater mode often or want to conserve energy usage during cold weather months. Other models only feature an on/off mode for the heater or a high and low mode. Oscillation For more even heating or cooling in a room, consider a combination fan heater with an oscillation function. This will help the unit to distribute warm air or a cool breeze through your space. Unlike a fixed-position fan heater that only directs air in a single direction, an oscillating fan heater can keep the air moving and make everyone more comfortable. Noise It’s no secret that not all combination fan heaters are whisper quiet. Sometimes a unit can emit a hum, especially in heater mode. While this can usually be overlooked, it may be bothersome if you’re looking for a combination fan heater to use in your bedroom while sleeping. Our testers found that the Lasko 754200 Ceramic Heater is a perfect option if you’re looking for an inexpensive heater to warm small spaces. According to our reviewers, while it doesn’t have a ton of safety features, like an automatic shut-off if it tips over, this product gets the job done: “[It] does what it's supposed to and not much else, but you'll be warm, which is the point,” one of our testers declared. Another bonus, according to our reviewers, is the noise level. “While it makes noise, it's not super loud, whereas other units I've used in the past sound like a generator when they're on,” observed one of our testers.